The consensus among “Progressives” and Left Democrats is that Alex Jones is a “conspiracy theorist” (allegedly involved in hate speech) and censorship against him has nothing to do with First Amendment rights which guarantee Freedom of Speech. 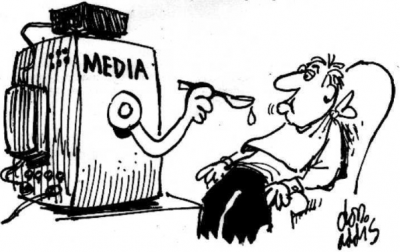 While the media has provided extensive coverage of the Alex Jones saga, the crackdown on progressive voices by self-proclaimed “Progressives” has not hit the headlines. 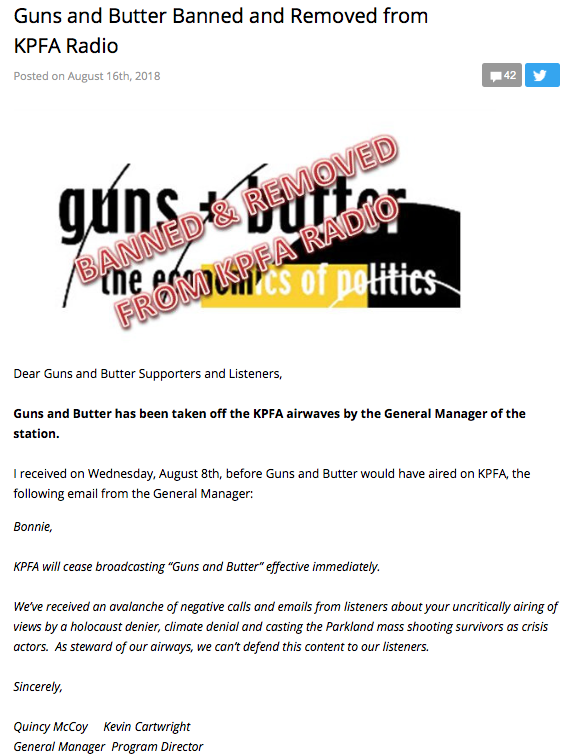 Bonnie Faulkner’s Guns and Butter weekly program on KPFA has been closed down by Pacifica. It was among the station’s most popular programs over a period of 17 years. Not a word from the mainstream media. Historically, the Pacifica Radio (KPFA) network based in Berkeley, California was a powerful independent voice. No more. Let us ensure that Bonnie Faulkner’s program goes back on the air. Below is the video recording from Aug 18, 2018 public meeting of the KPFA Local Station Board “Public Comments” session in Berkeley, CA. Bonnie Faulkner is speaking against the censorship of her Guns & Butter Radio show, which she has hosted for about 17 years. NoLiesRadio.Org is a Pacifica Affiliate, which entitles it to broadcast on the internet many of the same shows that are produced at KPFA and other network stations. Guns and Butter has been a popular program on KPFA for about 17 years. It has reached a new and wider international audience on internet radio via NoLiesRadio. Pacifica’s History and Mandate. Committed to the Truth??? 94.1, KPFA is a community powered radio station … For nearly 70 years KPFA has investigated the contemporary intersections of class, race, distribution of wealth and it’s affects on the citizens of our Northern and Central California coverage area. Over the years we’ve advanced the discussions and told the truth about historical moments of political impasse, racial tensions and economic inequality. Our mission and hope is to provide diverse programming that provokes thought and reaction on a complexity of issues for our community of listeners.